With over 35 years of experience in custom tube fabrication, our team at A/C Fabricating Corp. understands the importance of expertise in specialty part production. From management to engineering, we can expand our partner’s capabilities and help them exceed production capacity. Our vast skillset in tube fabrication allows us to create processes that match any design or manufacturing challenge. 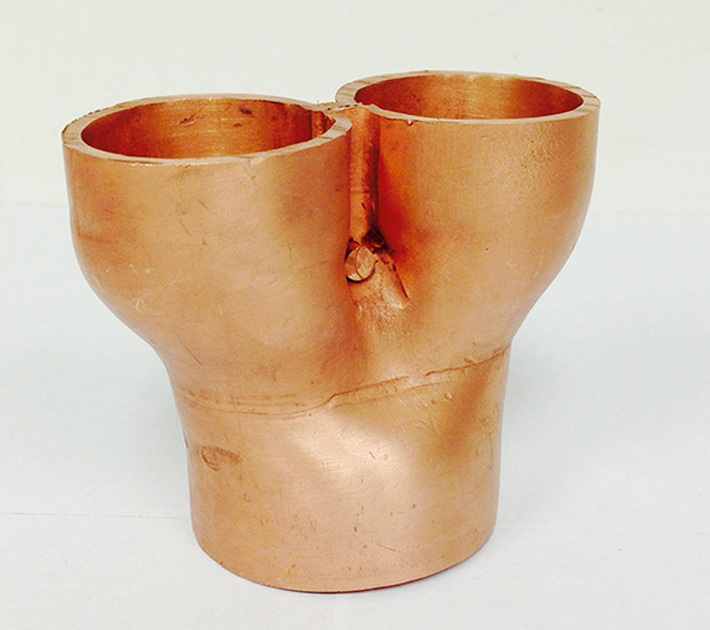 An HVAC customer in the Western United States asked us to redesign a cast bronze bifurcate part using copper. Additionally, the part had to hold a maximum pressure of 1900 psi and maintain strict adherence to their dimensional requirements. The bifurcate part had a diameter range between 2.375” to 3.91”, an exact length of 3.25” and a wall thickness of 0.156”. It was also required that the overall part tolerances be +0.0035”. Each bifurcate part originally weighed 4.5 lbs. 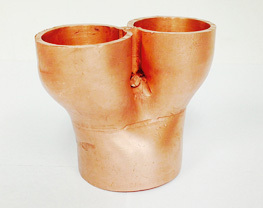 Our team was able to produce it to exact customer requirements using 2” copper pipe. Each part was manufactured using end forming presses, cold saws, and drill presses. We also conducted hydrostatic burst testing along with a series of dimensional testing, ensuring that the final part maintained the customer’s 1900 max psi requirements. A total of 125,000 units have been produce to date and the project startup time require less than 12 weeks between initial product redesign and machining. Not only was the part re-engineered based off the original bifurcate design, our team was able to dramatically reduce costs while improving quality. With a reduction in cost by nearly 50%, the customer would receive a significant $300,000 savings over the life of the product. With combined industry knowledge in both engineering and design management, we were able to dramatically reduce our customer’s costs while exceeding the dimensional and performance specifications of the part. We were asked to re-engineer a cast bronze part using copper tube with a requirement that it had to hold 1900 psi. We form the part out of 2” copper pipe and were able to hold the pressure required. Our design cut the cost by 50% and save the customer +$300K over the life of product.